Programming and editorial play a crucial role with every media campaign we launch. With Macias PR, every story begins with an internal analysis of the value behind the idea and the argument for why reporters or editors will like it. As the Executive Producer with NBC, I approved every story idea and script that came out of the Special Projects unit, which included consumer, medical, health, tech and features segments. I always looked for water cooler type stories that would get people talking. I learned early in my media career that these types of stories generated huge ratings – and when my stories generated big ratings, I was viewed as a winner. Our PR team also applies this approach to every media campaign. We make sure every story is relevant. First and foremost, we put editorial and programming at the forefront of every campaign. PR is about to get more powerful. 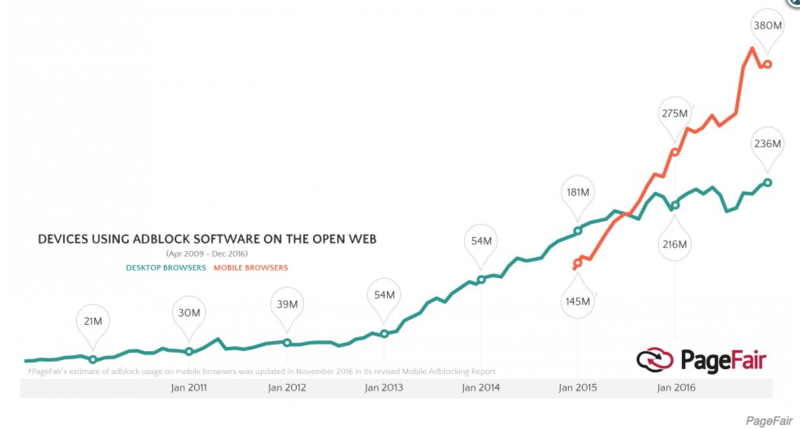 Roughly 380 million people already block ads from the browsers with different applications, as the above graphic demonstrates. Google Chrome is now reportedly close to adding a new feature that will allow consumers to block ads from any Chrome browser. The easier it gets for consumers to block ads, you know, the faster it will hit the tipping point. There are many ways to launch a media campaign so it is under-budget and efficient from the start. Here are four steps to ensure your PR Firm is continually working immediately after the contract is signed. There is nothing worse than paying for something and not being able to keep it. It’s like a car lease. You pay for years, but don’t get anything in return. Don’t let this happen to your social media side of the business. In today’s world, it doesn’t take much for a disgruntled customer to spark a crisis, ruining a business reputation. Just ask the CEO of United Airlines, Oscar Munoz. He is under fire this week for the way he responded to a video that showed a passenger getting dragged off a United flight. PR Week might have named Munoz the “Communicator of the Year” last month, but none of that matters today. It only took one viral video for everyone to forget the good he did in the past. I wrote an editorial today for CNBC, explaining three lessons every executive can learn from Munoz. (You can read that editorial here). If you’re short on time, here are the takeaways from that editorial. PR firms have a reputation for not being transparent. This stereotype is one reason why we release a quarterly media report detailing the publicity we secured for our clients. In the first quarter of 2017, Macias PR secured media placements for our clients with some of the biggest news organizations, including the Washington Post, US News & World Report, CBS New York, CBS Boston, Telemundo, Women’s Fitness Magazine, News 12, FOX 4, Oakland Press, South China Morning Post and Fast Company Magazine. Every business wants the best deal, but when it comes to PR, a few common rules for negotiating don’t typically apply. It’s important to communicate with the PR firm what exactly you are looking for from a PR campaign. Are you trying to drive new leads, or increase sales? Maybe you need credibility or are in crisis mode. All of those campaigns require a different strategy, approach, resources and budgets. 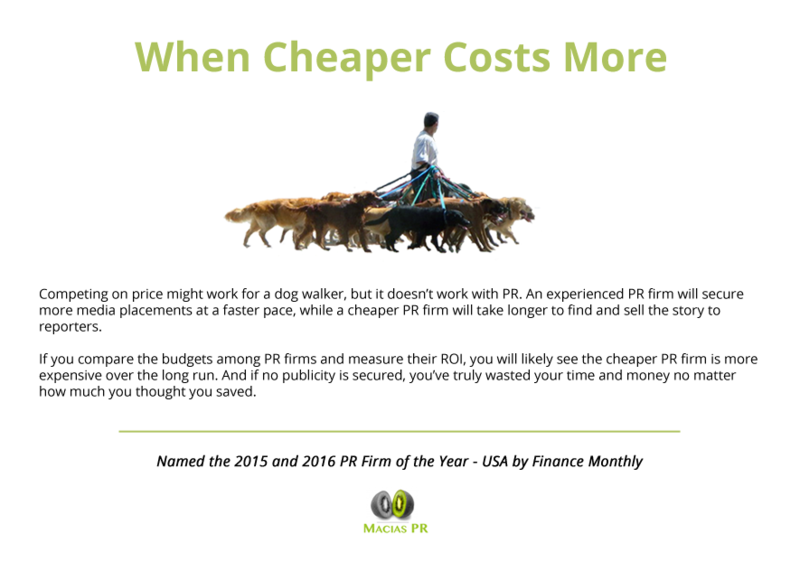 How Much Do PR Firms Cost? During my time with NBC and CBS in New York, I worked with a lot of inexperienced publicists who were trying to get stories on TV. Most of these publicists spent hours spinning their wheels, trying to get their ideas in front of us. From a business perspective, these PR firms were spending a lot of money upfront, trying to get traction with the media. A smarter approach would have saved them time and money.